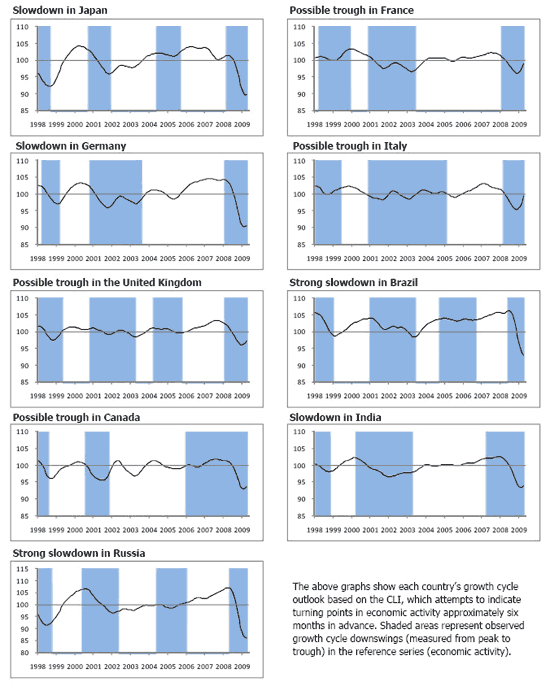 The Organization for Economic Cooperation and Development (OECD) announced in its latest report released on Monday that the composite leading indicators [CLIs] for April 2009 show a reduced pace of deterioration in most of the OECD economies with stronger signals of a possible trough in Canada, France, Italy and the United Kingdom. OECD’s report shows the CLI for the OECD area increased by 0.5 point in April 2009. The CLI for the U.S. increased by 0.2 point. United Kingdom’s CLI increased as well, printing higher by 0.7 point. The CLI for Canada, Germany, Italy and Japan increased by 0.4, 0.1, 2.1, 0.1 point in April, respectively. The CLI for China, India increased 0.9, 0.4 point respectively. Meanwhile, the CLI for Russia and Brazil decreased 0.3, 0.7 repsectively. OECD also said that major non-OECD economies still face deteriorating conditions, with the exception of China and India, where tentative signs of a trough have also emerged.